I recently finished up the draft text that summarized the land use and open space portions of the Detroit Sustainable Design Assessment Team (AIA SDAT) that I participated in a few months back. It gave me a chance to revisit some of the thinking around my initial thoughts and reactions - with some distance and further reading that has illuminated both the potential of what we proposed, as well as how much we could've/should've done to provide an actual 'vison' for the community. There has been some more recent coverage of Detroit, mostly focused around the blatant ridiculous giveaway, bailout for the car companies in Detroit - (save the big 3, save the world, right?) 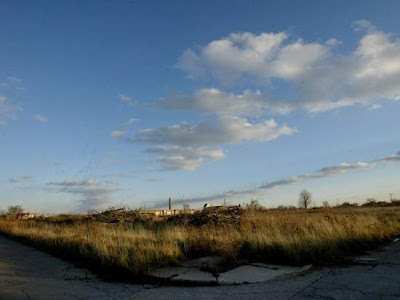 One such article, via Bloomberg, mentions the connection between industrial dissipation and the large amount of vacant lands. 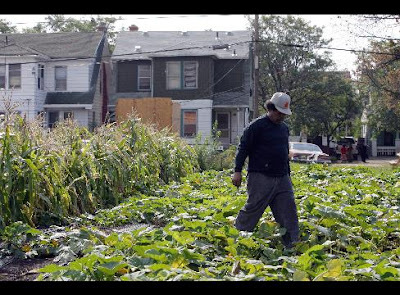 "GM's Bust Turns Detroit Into Urban Prairie of Vacant-Lot Farms" discusses vacancy, land banking, and urban farming, to name a few items. These photos come from the local group and their vacant farmland Urban Farming. Some of the highlights of the article align with the common thinking we came up with in the SDAT. A diversified economy, urban agriculture, land banking, reclaiming vacant lands, concentration of resources, and streamlining parks operations. Overall, there is the paradigm shift - the hard thinking that comes from the acknowledgement of a Shrinking City and how to realistically approach change. "Now, business coalitions such as Detroit Renaissance are moving forward with plans to identify neighborhoods where resources should be concentrated and help the area diversify away from cars. The organizations want to use local research hospitals to attract health-care and biotech startups, according to Doug Rothwell, president of Detroit Renaissance, as well as foster a creative community around the city's legacy of advertising agencies. " One aspect we discussed was how to spend some money that had been allocated for renewal... not enough to solve problems but to make a real statement. There was definitely a strong desire to make right some of the woes that come with the distributed leftovers of wide-spread vacancy: "On Nov. 25, the City Council passed a Neighborhood Stabilization Plan that seeks $47 million from the federal government to address the city's problem of vacant buildings and empty land. An estimated 55,000 lots are considered unproductive because they bring in no taxes and cost money to maintain. ... The grant would pay for knocking down 2,350 of Detroit's tens of thousands of abandoned homes and clear the sites for development. If no buyers materialize, planners would consider adding the space to public parks or land reserved for recreation or environmental preservation." We were definitely on the right track, but did we really tell Detroit something they already didn't know. Maybe, maybe not... but it was definitely reinforcing some of the strong trends already in place, for instance the strong push to move urban agriculture from a small scale to a larger scale operation. From Bloomberg: "With enough abandoned lots to fill the city of San Francisco, Motown is 138 square miles divided between expanses of decay and emptiness and tracts of still-functioning communities and commercial areas. Close to six barren acres of an estimated 17,000 have already been turned into 500 "mini- farms,'' demonstrating the lengths to which planners will go to make land productive. ...Harvests are sold in markets or donated to soup kitchens. This year's produce was picked ``quickly because people need food so badly,'' said Sevelle. ...The farms may also raise home values. In many neighborhoods, nearby gardens could add as much as $5,000 to selling prices, said real estate broker Russ Ravary, who works in the city and surrounding suburbs. The average price of a home dropped 55 percent to $18,578 in the first nine months of the year, according to the Detroit Board of Realtors." Another article from this month in the Detroit Free Press follows a similar theme, 'Acres of barren blocks offer chance to reinvent Detroit' provides some of the same thinking, and specifically relates some of the recommendations of our SDAT. "Earlier this fall, some out-of-town planners recruited by the American Institute of Architects visited Detroit for a brainstorming session. The leader, Alan Mallach, research director of the National Housing Institute in Maplewood, N.J., concluded that Detroit needs no more than about 50 square miles of its land for its current population. The remaining 89 square miles could be used entirely for other purposes, he said. ...Mallach's group liked the suggestion of large-scale commercial farming, both as a way to put the space to good use and to generate new income and jobs for the cash-starved city." The article paints a similar picture as well: "Detroit, where the population peaked at 2 million in the early 1950s, is home to about 900,000 today and is still losing people. 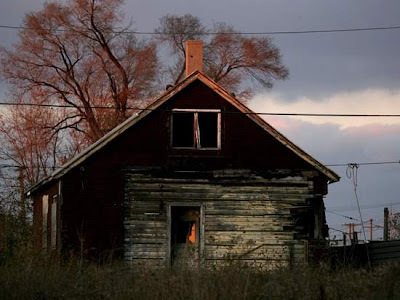 The depopulation and demolition of abandoned properties has left the city dotted with thousands of vacant parcels, ranging from single home lots to open fields of many acres." And comes up with some similar thinking: "This abundance of vacant land has people talking about new uses, such as urban farming, reforesting the city, and large-scale recreational areas. Urban farming is getting the most buzz. Michigan State University's College of Agriculture and Natural Resources is among the groups touting urban farms as a solution for Detroit's vacant land. ... Given the amount of open land, I think there's a real opportunity for Detroit to provide a significant amount of its fruits and vegetables for its population and the surrounding area," said Mike Hamm, the C.S. Mott Chair of Sustainable Agriculture at MSU." There is also the inevitable discussion of the politics of Detroit - which from our experience there, if one of the major sticking points. A quote from some past leadership leaves it open: "If it comes to pass that there is a development that would be in the best interest of the city, then it could always be redeveloped," former Mayor Dennis Archer said last week. "But in the meantime you could have great pocket parks, you could have children understanding how to raise a garden, harvest a fruit, vegetables. Those are invaluable things. I think it has a lot of merit." An interesting comment was from a group that seemed like a perfect ally to the idea. The group Greening of Detroit was a major informative group in our SDAT process, but the following quote leaves me a bit perplexed: "Ashley Atkinson, director of project development in urban agriculture at the nonprofit Greening of Detroit, supports small family and neighborhood plots of no larger than 3 acres. 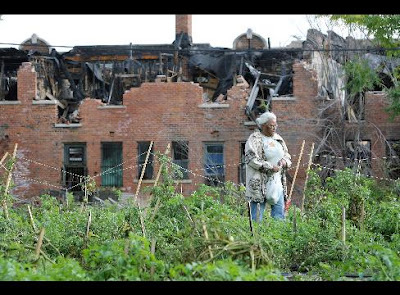 But she says that commercial farming would exploit Detroiters and their land. Instead, she supports widespread use of open spaces for recreation, hobby gardens and other uses." It's curious - although I don't want to neglect this viewpoint - the idea that commercial farming would exploit Detroiters and their land is just plain silly. The way to make the endeavor viable and profitable is not 3 acre plots... period. These work for self-sufficent homestead gardens, but not agriculture - and would dissipate the productivity of the land in ways that minimize the overall impact. We're not talking agribusiness, but cooperative and hands-on farming on a scale of 1000+ acres that provides an economy of scale to make it viable economically and provide resilience - without exploitation. It's also clear that residents don't want hobby gardens, recreation, and other uses - because there isn't the economics to maintain them to be safe and workable... I agree that the entire 80 sq.miles is not going to be farmed - the key is a It's a new model, and my only thought is that it would perhaps take away some of the great work that Greening of Detroit is doing - which is flatly not the case. They, and other successful groups in Detroit, are the pioneers that can take the reins and lead the way in making the urban agriculture/productive landscape approach work. Another part of the article that I was really interested in, was the juxtaposed map of land areas of Boston (49 sq.mi. ), Manhattan (23 sq.mi. ), and San Francisco (47 sq.mi.) laid neatly within the 139 square mile footprint of the City of Detroit. Prepared by Dan Pitera, a professor of architecture at University of Detroit Mercy and one of the more involved local participants, this really shows an indication of the immensity of the problem. 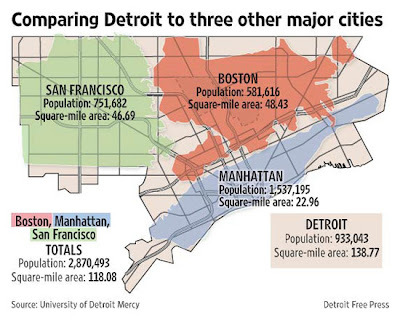 The article ends with the big question, and one that means that Detroit may be able to shift from being the poster boy for shrinking urbanism to the one that figured it out. "Whatever happens, clearly Detroit is evolving early in the 21st Century as a sort of blank slate. Instead of looking at shrinkage as a problem, many planners see it as an opportunity. Detroit has a chance to invent an entirely new urban model, they say. Whether it's farming or greenways or a network of thriving urban villages connected by transit lines, the solution could be uniquely Detroit's. And the likelihood is that the rest of the world, already fascinated by Detroit's urban drama, would take notice." And finally, an amazing resource that I've been trying to track down that has been an amazing find (gotta love Interlibrary Loan...) - 'Stalking Detroit' by Jason Young (editor), Georgia Daskalakis (editor), and Charles Waldheim (editor) is chock full of prescient Landscape Urbanism theory and writings - as well as much more applied thinking that we did in our four days in Detroit. From the Univ. 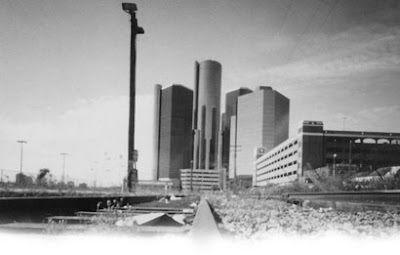 of Michigan Taubman College of Architecture and Urban Planning site, a quick synopsis: "Published in late 2001, the book subtly blends sixteen stand-alone features with over one hundred color photographs and duotones to bring the reader right to the center of Detroit itself. The energy of its design and in its words articulates the former power of Detroit and questions the myriad revitalization efforts to date." And from the books introduction (p.10): "Detroit is the most thoroughly modern city in the world. Modern, not of course for its great works of architecture or its progressive social advancements, but modern in the sense that this city has exemplified the assumptions of enlightened modernity like no other. Among those assumptions was a tacit belief that technological advances stemming from empirical knowledge of the world could necessarily lead to social progress. From our perspective at the turn of the century, Detroit, rather than corroborating modernity's faith in progress through technology, affords an extraordinarily legible example of post-Fordist urbanism and its attendant forms of human subjectivity as shaped by the city's continuously and rapidly transforming economic, social, and operational conditions." With writings from James Corner, Charles Waldheim, Georgia Daskalakis, Patrik Schumacher and Christian Rogner - amonst others - this tome is worthy of a further exploration once I have a chance to get through it. Now if only I had access to that before heading to Detroit. As you note, Detroit’s ability to confront its depopulating reality and to plan and reinvest accordingly has long been stymied by (if not caused by) its politics as well as by its lack of resources and vision. As a mark of its relentlessly negative progress, I have a sense that the number of studies published about the problem may now be rivaling the number of people left in the city. It is now interesting to see proposals for urban agriculture in Detroit as an end rather than a means. Addressing the subject recently, myself (http://archizoo.wordpress.com/2008/12/18/5/), I recalled the context and focus of much conversation and study for revitalization of the city in the early 1990’s, and how the idea of urban open space was seen as a catalyst for redevelopment. Late in Mayor Coleman Young’s administration I had been proposing and beginning to curate a series of exhibits at one of the local galleries with a unique interest in creative visions for the future of the city and the role of architects in urbanism. One of my ideas, with a working title of “Projects for a Shrinking City,” never saw the light of day. The subject was one that, of course, was in every conversation with every professional anywhere in the city. But when I asked a number of them to participate by generating works for the exhibit, I was almost universally rejected. The title was cited by most of those refusing to join the show—fear of being cut by the mayor out of projects in the city because of the civic embarrassment evoked by the concept that 20 years of Young’s “leadership” was producing negative results. The tone changed, a bit, with a new administration. A short time after his election in 1993, I was part of a team engaged in a Land Use Task Force supported by the new mayor of the city, Dennis Archer. This “framework” plan was later criticized as a barrier itself for its proposal to develop reinvestment strategies, delaying action on the urgency of development needs. I remember the sketches produced in the course of the studies. After mapping out the extensive depopulation and disinvestment that had and was continuing to take place in the city, it was easy to see a huge band of land immediately outside of the central business district that was becoming progressively vacant (the area used for the title sequences in my reference to “Easy Streets”). This area, increasingly illustrated green, was seen as an extensive open space and park system. For some, imagining New York’s Central Park, the open space was seen as a catalyst for exuberant redevelopment at its edges. Thanks for the comments from in the trenches, as well as the kind link on your site... it's a fascinating and complex urban issue - and I appreciate the perspective and history that was expressed in your comment. We heard a lot of comments in our short time there saying, in essence, 'we can't rely on the government to do this'... which was both inspiring due to it's grassroots strength, and daunting, as the problems are so immense, it needs everyone to make a go at coming up with solutions. It is an delicate topic to talk about the 'shrinking' nature of any city - and it was definitely something that we tried to feel out and ended up tip-toeing around quite a bit while moving forward - much to the detriment of our overall potential. That is not to say it wasn't a valuable process, but rather we missed an opportunity to confront the issues with less baggage as outsiders. 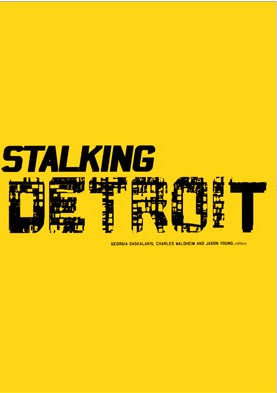 It's too bad that the 'Projects for a Shrinking City' was never realized, as some of this prescient work on the topic, similar to that from the later Stalking Detroit, would be great information to inform and shape the current dialogue now that some of the tough realizations are now finally beginning to be addressed, some 15+ years later. The idea of a flexible space - what we called opportunity areas - to me was a valuable compromise, which allowed for urban agriculture, open space, a large Central Park (which everyone summarily dismissed), future redevelopment, and whatever could be envisioned... using the landscape urbanist idea of a fields to be programmed for a temporally-based use over the span of 20-30 years. This avoided the issue of thinking of this green space as 'an ends'... and allowing for future use determined by the future - not by some static master plan. In our case, this started with relocation, remediation, then reclamation that included usable open space greenways, large-scale urban farms, and potential residual redevelopment at the peripheries of transit corridors and urban villages. A final solution... no, but a good additional step in the right direction. Either way, what you and others in Detroit accomplished or provided vision for these subsequent steps - whether that be a cornfield, a field of sunflowers for biofuels, and perhaps some good old-fashioned farming. One way or the other, politics willing, there can be some positive change for all to see. I find that assessing density in terms of "total population divided by square miles" is a bit misleading. For instance, in Portland, we are bounded by geographic features which make development in those areas difficult (at least in terms of achieving high density in them) such as along the Columbia River, West Hills, and Forest Park (which I believe is the nation's largest urban park). All of these locations are included in the 134 square miles of Portland's boundary, but are limited in their ability to be developed or are set aside by the city to not be developed. Click on the "Map of Persons per Square Mile" on the lower part of the page. Looking at those maps it shows that Portland is reasonably dense in many areas, and Detroit looked surprisingly dense as well. But looking at how many people it has lost just in the last 10 years is absolutely amazing. I think we'll know more when the 2010 census comes out. I'd like to hear a planner's opinion about this, but I find visual maps to be more credible than facts and figures. There's just too many factors that are not included in a simple number or percentage. Good point Wes - and thanks for the comment. There is an abundance of parks and open space within the City Limits. A quick check at Portland Parks puts the total number within Portland at 12,591 acres, which pencils out to 19.7 square miles (half of which is Forest Park)... putting a dent in that number, but not a very large one. If we factor in unbuildable lands, there's still a good chunk of land at a very minimal density. I'm not saying that this straight size to population density isn't skewed in some way, and am definitely a fan of our land-use system - I'm justing thinking that people would be surprised to see the overall land area compared to some other urban areas. The link the census map is definitely helpful (I'm one of those visual types as well) - and does reinforce what I thought - that concentrations radiate out surronding downtown to the lower density peripheral interburbs in east county, north portland, and SW. I have been playing around with these maps to show some of the variations within the city, as well as compared to some of the other communities in Dan Pitera's map. Should be some interesting analysis.